Stacy’s got a problem. Pen-pal Craig is on his way to visit her. 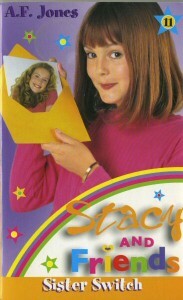 In a moment of madness Stacy had sent a picture of Amanda to Craig, and said that it was her! Yes, skinny, mousy, freckly Stacy has tried to pass herself off as blonde bombshell Amanda. Now Craig is en route to finding out the awful truth. Can Stacy keep things under wraps, or is her cover about to be blown… big time…? !